With Yojimbo running April 18th at MOMA as part of Kazuo Miyagawa: Japan’s Greatest Cinematographer I've asked JB if I could repost his review from when the film played at a Kurosawa retrospective at Film Forum several years ago. As he did in Rashomon, Akira Kurosawa created an influential cinematic template with the first film appearance of Toshirō Mifune’s nameless ronin, which has since been copied in dozens of films around the globe. Yojimbo’s story of a mysterious drifter who cleans up a corrupt small town by playing two rival gangs against each other clearly inspired Sergio Leone’s A Fistful of Dollars, Walter Hill’s Last Man Standing, and Takashi Miike’s Sukiyaki Western Django, as well as a host of lesser known imitators. Yojimbo’s influence even extended to jazz when Jason Moran covered its theme on his first trio CD, Facing Left. Indeed, Mifune’s slacker samurai would prove so popular, he would soon return in Kurosawa’s follow-up, Sanjuro, which screens together with Yojimbo (trailer here) as a double feature during Film Forum’s retrospective celebration of the Kurosawa centennial. A master-less samurai walks into the crummiest town in Edo Japan. How bad is it? Stray dogs walk down the street with severed hands clenched in their jaws. Rival crime lords have waged a prolonged war that has depressed all local commercial activity, except the casket-maker’s business, where orders are booming. Getting the lay of the land from the local tavern-keeper, the crafty swordsman decides to clean-up the town by manipulating the two gangs into killing wiping each other out. Fortunately, sake helps him think. When pressed for his name, the nameless one replies, “Kuwabatake Sanjuro,” which roughly translates as “Mulberry field, thirty years old.” Being one big, bad customer, both gang leaders want to hire him, ostensibly as a “yojimbo” or bodyguard. Of course, neither side deserves much sympathy, but Ushi-Tora’s faction backed by the local sake merchant is arguably much worse, having kidnapped the wife of an unlucky gambler to settle his debts. They also turn out to be more dangerous, thanks to the return of Unosake, Ushi-Tora’s pistol packing younger brother, (played by Tatsuya Nakadai, who would return as a different foil for the ronin in the sequel, Sanjuro). If Mifune’s cynical mercenary who still lives by his bushido code sounds like a familiar character type, it is because Yojimbo set the standard for all the mysterious drifter films that followed. Of his many collaborations Kurosawa, “Sanjuro” might be Mifune’s most enduring, quintessential screen role. Often humorous, sometimes deadly furious, but always larger than life, it is a true movie star performance. Though considered a jidaigeki or Edo period drama, Yojimbo also shares a certain kinship with some of Kurosawa’s film noirs. Inspired by American westerns and perhaps the novels of Dashiell Hammett, it would in turn inspire the spaghetti westerns of Leone and Corbucci, which Takashi Miike would eventually re-import back into Edo Japan with Sukiyaki. Yet, no subsequent film has approached the mastery of Yojimbo. Though acknowledged as one of Kurosawa’s masterworks, it should not be considered stuffy, pretentious art-house cinema. 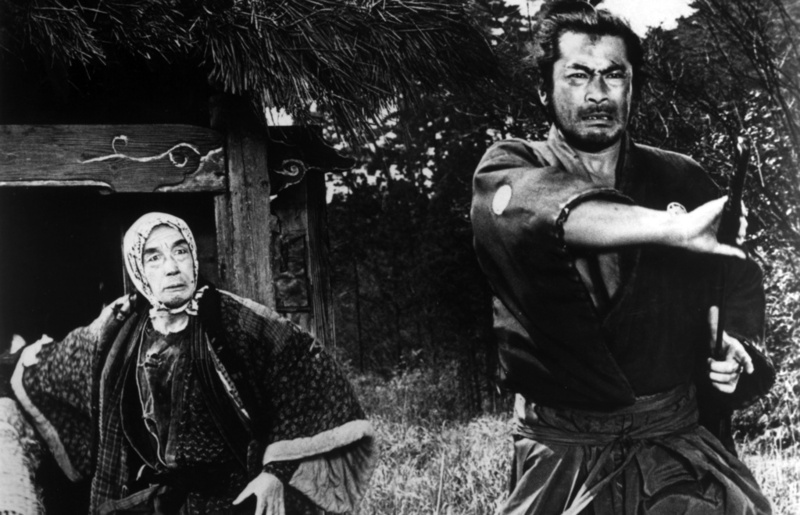 Yojimbo is too much fun to be missed due to reverse cinematic snobbery.